Leveraging Instagram analytics to improve your brand’s social reach and engagement is crucial for companies across all industries. Here’s why. At first glance, Instagram seems to be a one-trick pony. After all, how unique can a photo-sharing app be when literally every other social media app out there allows you to do that too — and more? But Instagram is not to be underestimated. According to our 2017 Digital Marketing Analytics Report, Instagram has the highest levels of engagement out of all social media channels for both B2B and B2C companies. The social media analytics don’t lie: Instagram should be one of your primary tools for getting people to talk about your brand. But how should it best be utilized? How can you rise above simply spamming photos to become a thoughtful, effective, and above all compelling brand on Instagram. It’s all about Instagram analytics. Like many social media channels, Instagram offers data-minded marketers scads of information that can make or break your channel. The key, therefore, is becoming familiar enough with the metrics you have access to and cherry-picking those that matter to your campaign. Here’s a breakdown of both the most commonly-tracked Instagram metrics available in TrackMaven’s marketing analytics platform. Total posts: Total number of posts published in a given time period. Total likes: Total number of likes received across all posts in a given time period. Total comments: Total number of comments received across all posts in a given time period. Total interactions: Total number of interactions (likes and comments) across all posts in a given time period. Followers: Total number of Instagram users following a given Instagram account. Interactions per post per 1000 followers: Number of interactions a post receives per 1000 followers for that brand. Likes per post: Number of likes received by an individual Instagram post. Comments per post: Number of comments received by an individual Instagram post. Percent change in followers: Percentage display of the trend over time of increase or decrease in an account’s Instagram followers. Impact score: Engagement rating relative to your brand’s average post performance. Taken one at a time, these metrics are useful but don’t say much. Taken together and in context, however, and these humble metrics can mean all the difference between a social media campaign that soars and one that falls flat on its face. Instagram metrics take on a whole new level of meaning when used in conjunction with a competitive brand’s data. What used to be merely an interesting collection of numbers now exposes your marketing campaign’s strengths and shortfalls. 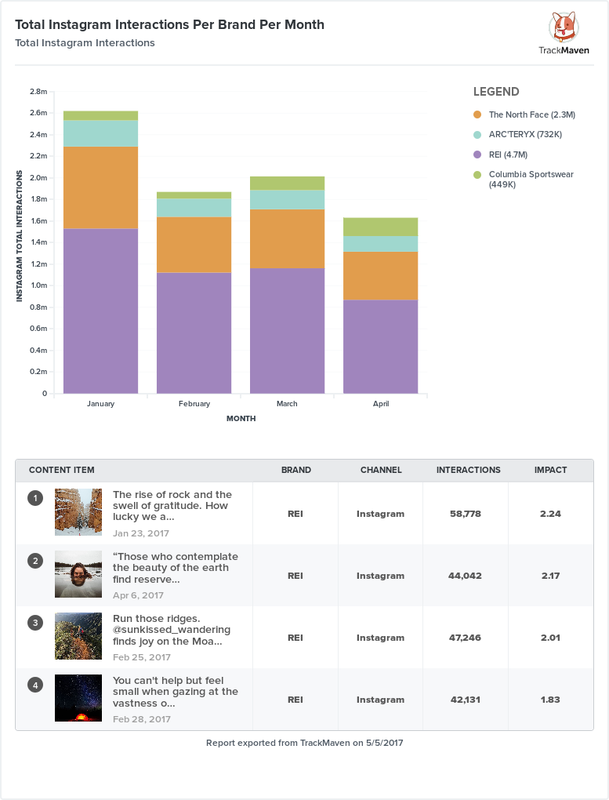 You can beef up reports like this by doing comparisons on individual post performance, customer segments, and even Instagram filters used. What metrics should I track in my Instagram analytics reporting to improve performance? Because Instagram’s biggest strength (as mentioned above) is engagement, then it stands to reason that you should be gearing the bulk of your attention and effort toward improving engagement-related metrics as well. Notice that you can track Instagram followers and likes, but they’re left out of the list — not because they’re not important, but because they don’t directly contribute to engagement. Yes, Likes count towards interactions, but you can’t reciprocate a like. Comments are where brands have a real opportunity to engage and take the conversation further. As your Instagram reporting tool begins measuring the number of comments each post receives, you’ll be able to see which posts drive the most conversations and assess what about them is so engaging. The best Instagram analytics tools also allow you to see this information as a trend line, so that you can assess whether your engagement levels are improving or declining over time, and what was being done at that point that may have triggered the change. But the above metrics aren’t the only criteria you can use to suss out the secrets to engaging content. Even something as simple as the time of day or the day of the week can have an effect on how much attention posts get. Savvy social media marketers will already know about the value of using hashtags in Instagram posts, and combining the above metrics with these hashtags are a great way to solidify your list of effective, go-to hashtags. In TrackMaven, that’s done by applying tags to items in your content feed. With these tags in place, you can then do a thorough hashtag analysis of both your account’s content and that of your competitors. Instagram filters deserve a special mention, because they’re a drastically underused resource. The Mayfair filter is the most notable, which has an average impact score of 1.1 whenever it’s used by a Fortune 500 brand. Consider tagging your posts with whatever filters were used and run your own tests. That way you have first-hand empirical data on what kind of an impact filters are having on your engagement levels. What metrics should I use to prove Instagram’s impact? Like any social media channel, Instagram needs a lot of consistent care and attention if you want to see results. That is a load on resources that the marketing team will justify. And the best way to justify a marketing strategy is to show hard numbers. Impact is the best metric to use by far when determining relative success, as it measures engagement levels compared to the average. This makes it easy to report on successful posts and the effect they had on your overall engagement levels. Another metric that can assist is percent change in followers, which shows the momentum your social media efforts are having and the growth of your audience over time. But simply looking at raw numbers sometimes isn’t enough to understand the whole situation. Fortunately, the best Instagram analytics tools have heavy-duty reporting options that allow you visualize your brand’s performance on this and other social media channels. Trend lines, bar graphs, competitive analysis, and more are easily accessible at the touch of a button, and can even be compared side by side with other channels. By utilizing the right Instagram analytics, marketers can leverage this high-engagement social media platform in a way that drives positive conversation around the brand and creates genuine connections with both customers and prospects. 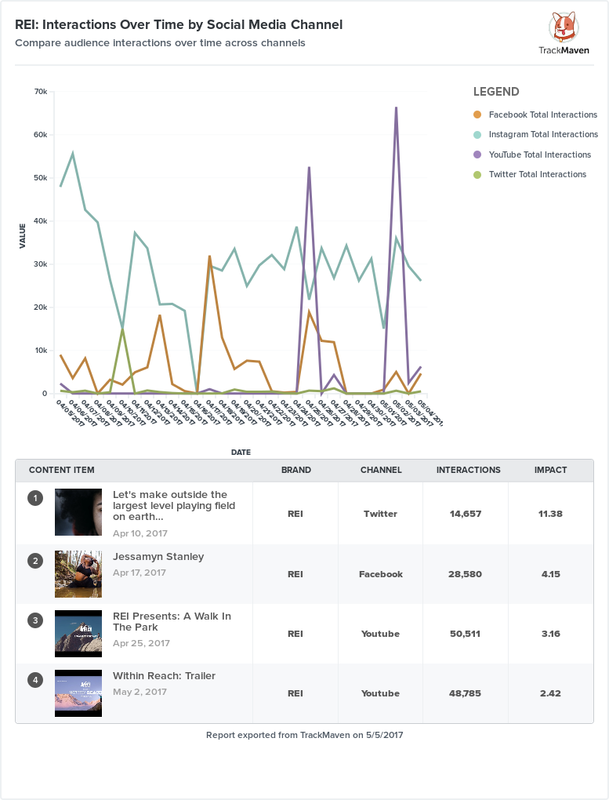 As you start looking for tools to assist with your social media analytics, keep in mind that only the best tools offer both deep analysis of metrics and the flexibility of displaying information in useful ways that drive insight. And remember that while more metrics are always good, the right metrics are always better. 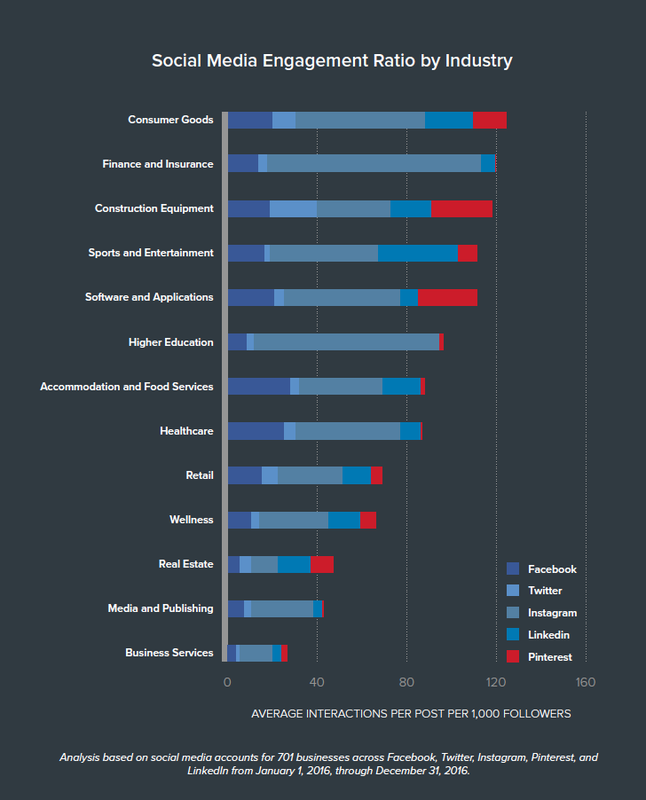 Want to uncover Instagram analytics benchmarks for your industry? Download your free copy of the 2017 Digital Marketing Analytics Performance Report report today!